With the Long-Term Test Correct you can measure the CO2 content of your aquarium over the span of 1 month. The CO2 Special Indicator responds to the CO2 content by changing colour: blue = too little CO2 green = ideal CO2 level yellow = too much CO2 The level of CO2 in the aquarium can be read directly from the six-colour scale in milligrams per litre. This provides a simple and reliable means of setting the correct CO2 supply level. The CO2 long-term test Correct even allows you to monitor the pH value in your aquarium at the same time! Key benefits: Simplicity: No additional measurement of carbonate hardneΒ is neceΒary. Only a single colour-matching scale is required. Safety: The CO2 long-term test Correct pluspH indicates the CO2 content correctly at all times – independently of other acids in the aquarium water (e.
g. humic acids). Measuring accuracy now also remains unaffected by any changes in carbonate hardneΒ as a result of increases in the hardneΒ of the water, evaporation or water changing. Accuracy: The CO2 long-term test Correct allows direct determination of the CO2 content in millilgrams per litre – avoiding the need for additional water measurements and the laborious practice of converting values in tables. The test is equally efficient at low carbonate hardneΒ levels. Conventional long-term CO2 tests are filled with a mixture of aquarium water and "drop indicator". In contrast, the CO2 long-term test Correct employs a high-purity, ready-to-use "ampoule indicator" which has been developed especially by Dennerle. 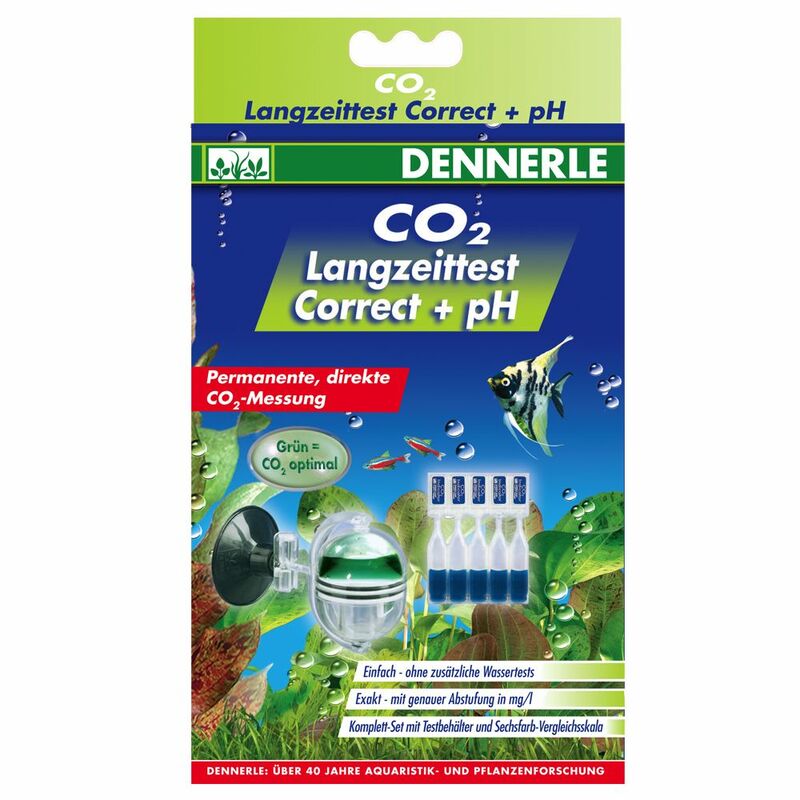 Dennerle CO2 long-term test Correct plus pH includes: Complete-set with test container 5 x CO2 Special-Indicator for a total of 5 months Six colour matching scale.